Give your boat's vinyl the protection it needs! 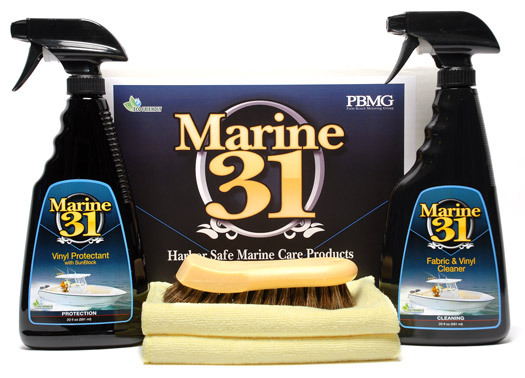 The Marine 31 Vinyl Cleaner & Protectant Kit gives your boat's delicate vinyl surfaces a fighting chance against the tough marine environment. Sea air and sunlight will quickly stain and fade vinyl surfaces. If left unprotected your seat cushions and trim pieces will quickly degrade. In order to maximize protection you must have a clean surface. That is why the Marine 31 Vinyl Cleaner & Protectant Kit includes the excellent Marine31 Fabric & Vinyl to cleanse and prepare the surface. In order to increase the cleaning power in a gentle manner, a Natural Horse Hair Brush is included. Once cleaned, treat all vinyl surfaces with the easy-to-use Marine 31 Vinyl Protectant with SunBlock. Dirt, salt, mineral deposits, traffic, and suntan oils make the marine environment one of the toughest for fabric and vinyl surfaces. Marine 31 Fabric & Vinyl Cleaner is a gentle water-based cleaner designed to remove various types of soiling and stains from fabric and vinyl surfaces. Based around a new technology in cleaning surfactants, Marine 31 Fabric & Vinyl Cleaner will not affect the delicate ecology of aquatic life. Marine 31 Fabric & Vinyl Cleaner is harbor-safe and eco-friendly. Use Marine 31 Fabric & Vinyl Cleaner on all vinyl, carpet, canvas, and upholstery surfaces in the inside and on the outside of your boat. Keeping these surfaces clean is the first step in prolonging their life and increasing the joy you get from piloting your ship through the bays. Marine 31 Vinyl Protectant with SunBlock is an advanced spray formulation designed to prolong the life of your boat, watercraft, or recreational vehicle's vinyl surfaces. Marine 31 Vinyl Protectant with SunBlock is formulated with Ciba Tinuvin UV Inhibitors. These are the most advanced ultra-violet light blockers in the world. Give your vinyl the protection it needs to last in the tough nautical environment with Marine 31 Vinyl Protectant with SunBlock. Use Marine 31 Vinyl Protectant with SunBlock on all interior and exterior vinyl surfaces including bimini tops, seat cushions, trim lines, and more. It creates a water-resistant protective coating that prevents mold formation and stops fish scale, body oil, dirt, and soil from staining. Vinyl that is protected with Marine 31 Vinyl Protectant with SunBlock will clean easily with just a wipe of a damp towel. The Natural Horse Hair Interior Upholstery Brush is extremely soft and packed with thousands of genuine horse hairs. The super soft hairs are perfect for delicate leather, vinyl, cloth, and scratch sensitive plastics. The Natural Horse Hair Interior Upholstery Brush works well on all interior surfaces. You can use it dry to dust and brush away grime, or use it with your favorite cleaner for improved cleaning power. Either way your vehicle will feel pampered by these amazingly soft hair bristles. Use these microfiber detailing towels for drying, buffing, or as a finishing wipe down. Microfiber is designed to be light, strong, super-absorbent and quick drying. The fibers are non-abrasive, and are woven so tightly that it�s absolutely lint free and extremely durable. Unbelievably, these ultra-tough fibers are engineered to absorb seven times their weight in moisture. A Word from the Captain's Chair: In order to get the best protection possible it is important to clean your vinyl surfaces first. Clean the surfaces with Marine 31 Fabric & Vinyl Cleaner, then apply Marine 31 Vinyl Protectant with SunBlock to lock out the sun and sea's damaging effects. Look great while you sail the seas! Anchors up!